I found the following screenshots on one of my old backup CDs from 2003. 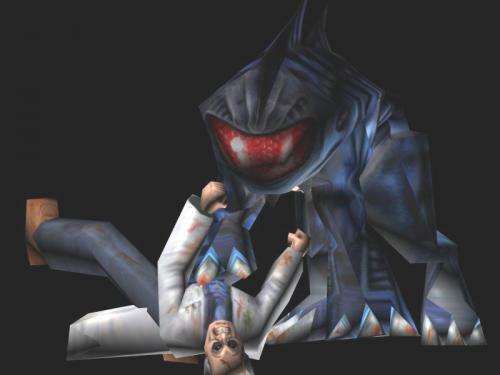 Does anyone have this alpha version of Half-Life? The players character looks soooo ugly! Is this Gordon? Man, i wish i had that version! I found some more picture and a few videos here. If anyone has any beta/alpha please upload it. It would be extremely fun to play. It would be awesome if I could find it. 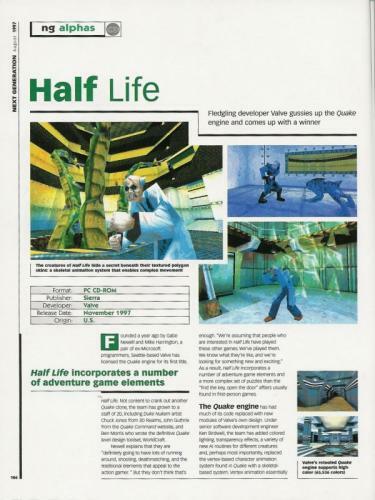 The Half Life 1 beta was released? Yeah, some people had it back in the day. It's practically non-existant nowadays or extremely rare. If someone had it back in the day, someone's probably still got it. Somewhere. The first page has a ton of pictures on it comparing the final game to the beta images found. Also at the end of the topic theres a petition to get valve to release the beta on steam for the 10th anniversary of Half-Life. I forgot that I have a copy of the Dreamcast HL1 beta. I've played it, and still have a functioning Dreamcast to play it on. Perhaps I'll rip it for anyone interested? Lots of people have that beta. Its well after the completion of Half Life 1 and was developed to include the high definition models and Blueshift. Once it was cancelled the models were further fixed up and released as the High defintion pack and Blueshift as we see it today. Try a torrent site if you want it, "Half Life DC Gold". The Dreamcast version is not a beta, it's the final product, it was just never released. Does it contain other models/maps or is it exactly the same as the PC final? As far as I know, it's exactly the same (with added High Definition models, but they were released at a later date for the PC also, so it doesn't count). Its not the final product. But it was as far as it was developed. The menus are still lacking / buggy and Blueshift, although on the disc, can't be accessed. There is some other stuff that can't be accessed as far as i can remember, but its nothing that isnt in the PC version. Could you post a picture of the disc (in case it is an orignal disc)? Also, here's a good place for a few pictures and a direct link, but im not sure if the boxart is official. 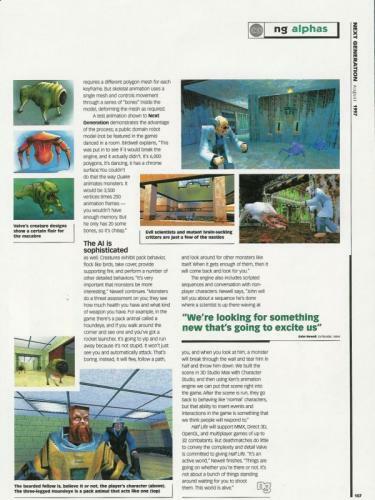 the game could be considered as a blue shift beta, the high definition models from the dreamcast version has some few differences with the pc version, the same for the maps and textures. You can check it with the Prima Dreamcast Guide, or playing the game. I've got a very early beta of Half-Life. Not sure if it is the version you're looking for, but it doesn't matter anyway. It doesn't work on any current system, you need some 10-year old hardware to make it work. And even then it crashes often. Probably the reason why no one ever bothered releasing it..